Paul’s studio works from the ancient Eastern tradition of transmission where the painting passes through the artist. Therefore the paintings are only signed on the back. Paul has two full-time assistants that have been with him over ten years. He also works closely with Master Tibetan painter, Yeshi Dorjee, as well as artists in Bali, Nepal, India and Tibet to ensure the quality of each Sacred Deity or painting. We are located in beautiful Laguna Beach and open by appointment only. Namaste. 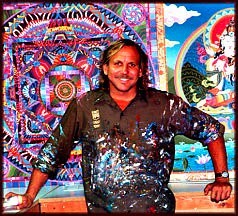 “We are all circles on the great mandala, and by changing the intensity of color, we clarify the fullness of each circle. Every soul is a circle with a unique combination of color and intensity. Each circle contains two individual circles with a delicate membrane between them”. As I began to open up this ancient doorway, I received access to and understanding of a soul language that has powerfully changed my life and the lives of all those who come into contact with this level of intuitive knowing. One of the true gifts of this language is a deep understanding of the patterns, symbols, and currents in Nature and how they relate to my own soul’s unfoldment and development. These insights highlight my journey into the potential of full radiance of the soul. As I look into my own soul’s pattern. I have come to see the “long body” (a way of seeing the past) of my own soul’s unfoldment.